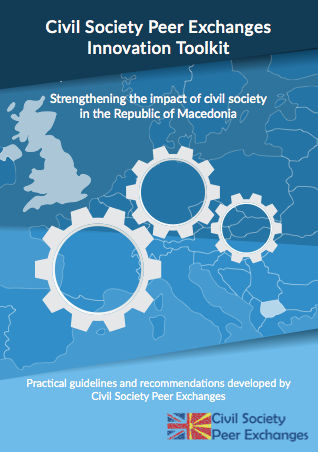 Through sharing best practices between the UK and Macedonia, our pilot Peer Exchanges project (June 2014-March 2015) empowered civil society leaders to have a lasting impact at ground level and develop sustainability. Through an open competition, peer exchanges and masterclasses, we created links between UK and Macedonian CSOs, with a focus on those working in human rights, policy making & advocacy, transparency & accountability and economic opportunities. We then developed a best-practice toolkit including recommendations and practical tips for influencing democracy and civic engagement. The project delivered immediate and lasting benefits for British and Macedonian civil society with many of the partners still working together to tackle common challenges. Please contact Marta Bruschi for more information about our Peer Exchanges. Includes recommendations and practical tips for influencing democracy and civic engagement.